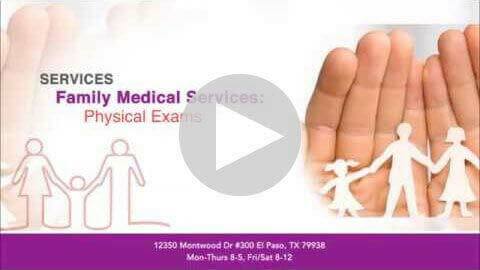 El Paso Family and Pediatric Clinic offers family and pediatric care to the El Paso community. Make an appointment or drop by if you need service in a crunch. With us, your family’s health comes first. When it comes to your family, you want to make sure they’re receiving the best care. We treat every patient with care and respect. Our clinic accepts all medical insurance, so there’s no fuss with finding one that does. In life, sometimes you need to make compromises. However, this should never be the case concerning medical care for you and your family. As a pediatric walk-in clinic, El Paso Family and Pediatric Clinic aims to help you and your children with those spur of the moment accidents and illnesses that seem to happen at the worst times. Whether it’s the flu or a simple cold, if your child falls ill or is in need of immediate care, we’re available on a walk-in basis to assist you. We know sometimes it’s impossible to schedule an appointment in advance, and we don’t hold it against you. Life with children can be a crazy ride, and you can’t always foresee when things will go wrong. We’re lenient because we know things just go wrong sometimes. Our pediatric walk-in clinic in El Paso caters to those unexpected mishaps, sneaky illnesses, and other worrying surprises. We offer regular and sports physicals for the upcoming school year. We also provide state vaccines, for which you must bring your child's shot record. At El Paso Family and Pediatric Clinic, we know that not every trip to the pediatric clinic is caused by a surprise. If your child needs their yearly state vaccines, immunizations, or physicals, we can help with all of their routine procedures. We also provide special care including chronic illness assessment and treatment. We offer services to help with autism and cerebral palsy, along with others. No matter the issue, we’re here to assist your child. We can help your child from infant state vaccines and yearly checkups to comprehensive sports physicals so they can join an El Paso sports team or dance class. It’s important for your children to receive their yearly state vaccines, get routine physicals, and have their growth monitored. We are dedicated to helping them grow into healthy adults with little to no bumps along the way. We care about your child and their future, and we are here to help them through every milestone. When it comes to raising children, it’s also important for parents to stay in good health, which is why we provide family services. We know that health is important for a family to function happily. As a family clinic, we provide services to moms and dads, grandmas and grandpas, and all others who have illnesses such as diabetes or who just need state vaccines and other treatments. We also provide Department of Transportation exams, which are necessary to become a licensed truck driver. We have a medical lab on site, so it’s easier to get lab work done. Because our lab is so close, we receive results to routine tests quickly. This alleviates the inconvenience of having to go off-site for a test just to wait weeks before seeing any results. Sometimes, dealing with medical issues can be stressful, but we try our best to alleviate the majority of it. No matter the service, the practitioners at El Paso Family and Pediatric Clinic work hard to make sure you are seen in a timely, efficient manner. We put our patients first, so you have one less thing to worry about. We treat everyone of all ages to provide you with comprehensive pediatric and family care. You’re not just another patient to us. At our family clinic, you become family the moment you walk through the door.